A CAR THIEF targeted a Mackay car paint and repair shop in the early hours of Monday morning, managing to hotwire a ute and ram it through a fence to make a getaway. The crook got access to the Touch Up Guys car yard about 1.15am by jumping a back fence, and then spent almost two hours attempting to break into numerous cars, CCTV shows. 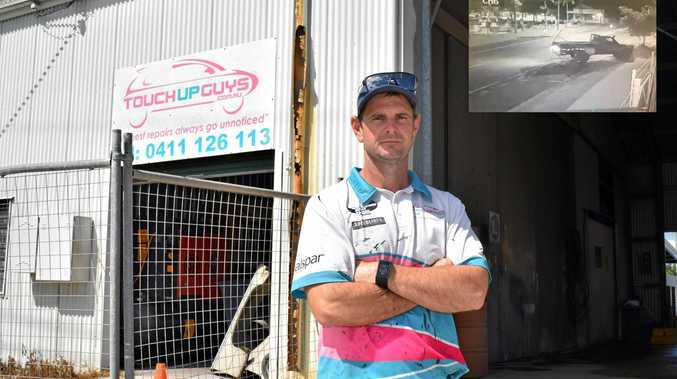 It has been devastating for Mackay Touch Up Guys owner Daniel Mayfield who said it had affected the owners of the vehicle as well as his own business. "It's really awful, this is my personal business, so to have some scumbag come and jump a fence, steal a car and do so much damage it's terrible for us but also our customer," he said. Watch as ute thief breaks out of car yard: A thief has been caught on CCTV breaking out of Touch Up Guy's car yard, after stealing a Toyota ute. "People bring their cars here in good faith hoping they'll be well looked after and we do our best to make sure that happens, but there's only so much you can do. "We have fences, CCTV, lights, security measures in place, and it still didn't prevent this, luckily the owner was extremely understanding and and knew there was nothing more we could have done." CCTV managed to capture footage of a man entering the West Mackay property from Cemetery Rd, attempting to break into a number of vehicles before gaining entry to the Toyota Landcruiser ute. The man then hotwired the vehicle and reversed it through the car yard's washing bay, through the front fence and out onto the road. The vehicle had only just had a fresh spray and was in "immaculate condition"," Mr Mayfield said. He also felt the thief must have been well-practised, as he managed to easily break in and get the car going without keys, which are kept hidden securely away from the car yard. Since the incident took place the vehicle had been seen by a number of residents and motorists driving at various locations, who each contacted the store and police. "Lots of people saw it and it actually ended up getting dumped down by the river on Wednesday, it had a fair bit of damage done to it," Mr Mayfield said. "But the good news is that police could return it to the owner, he was very happy to get his car back late last night. "Hopefully insurance will cover all the damage of the vehicle and also our fence which was torn apart too." The incident is just one of numerous car thefts and attempted car break-ins that have occurred in recent months in the region. On Tuesday two vehicles were also stolen from a business in Glenella. Police are amid investigations for each of these thefts.